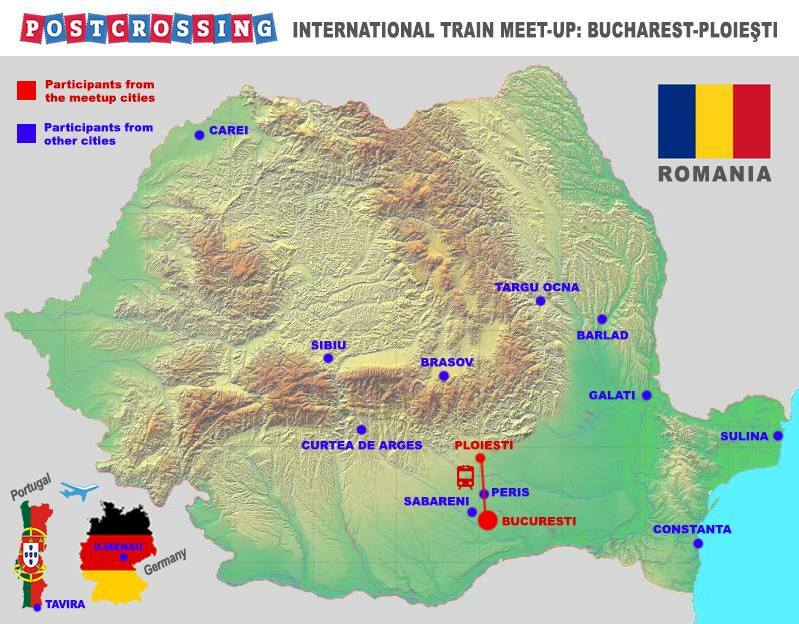 The first Postcrossing train meetup, in Romania! 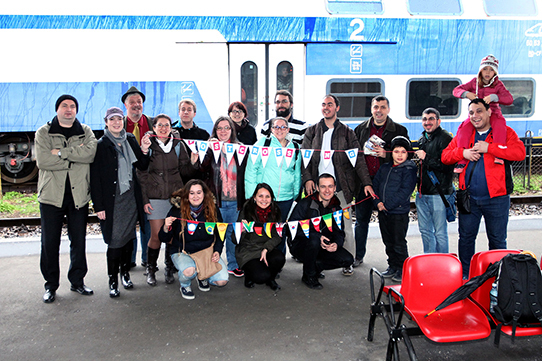 Blog > The first Postcrossing train meetup, in Romania! Remember the Little Mail Carrier’s cousin? It’s been a while since he was last on the blog… Earlier this year, he threw a huge tantrum and demanded to be sent on new adventures — so we sent him off to Romania, where an exciting meeting was about to take place! Here’s their report, as told by the participants in this unique meeting. 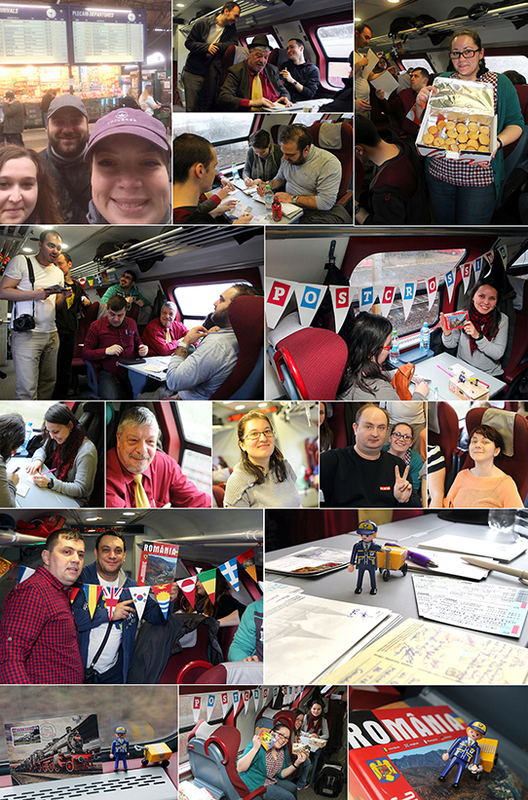 Once upon a very special day, on February 29th of 2016, the Romanian Postcrossing Community organized the first Postcrossing train meetup in the world, a round-trip journey between Bucharest and Ploiești. 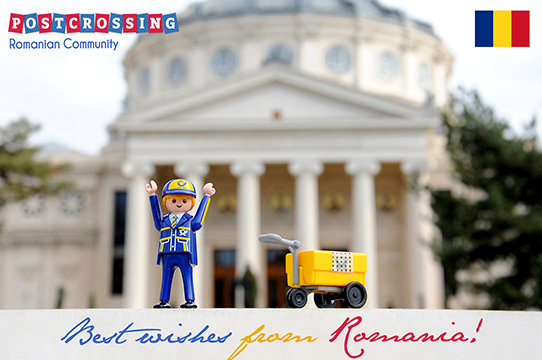 The day started with the arrival of the Little Mail Carriers’ cousin in Bucharest, the capital of Romania. 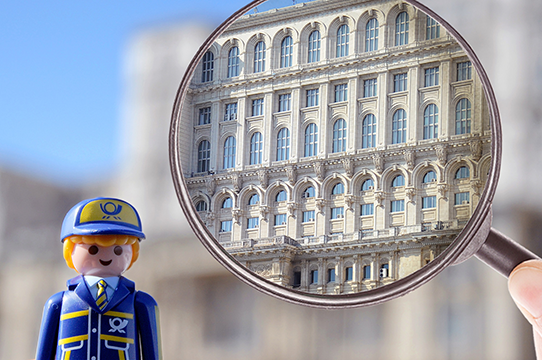 As every tourist would have done, he first went on a sightseeing tour through the wonders of Bucharest. Naturally, he took some selfies and because he is so small, a special “magnifier tool” was used to be sure everything is in focus! 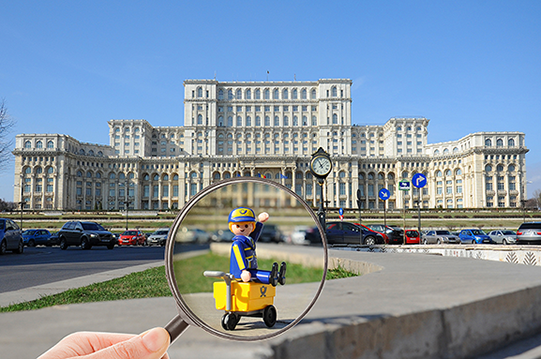 He started with the Palace of the Parliament which is the heaviest building in the world. It is also the second largest administrative building in the world (after the Pentagon in the USA) housing the Romanian Senate and Parliament and the National Museum of Contemporary Art. 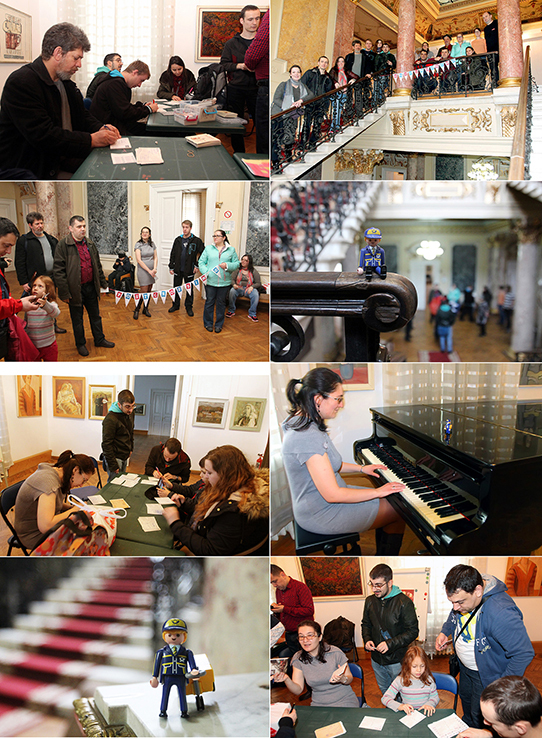 He continued his tour to two of the most prestigious buildings in Bucharest: the House of Economies (CEC) and the National Museum of Music (Cantacuzino Palace). In front of the Romanian Athenaeum he got really excited, because inside is the longest circular fresco in the world! It was done by Costin Petrescu, and is a stunning piece depicting 25 different scenes of Romanian history over 70 meters of canvas… wow! 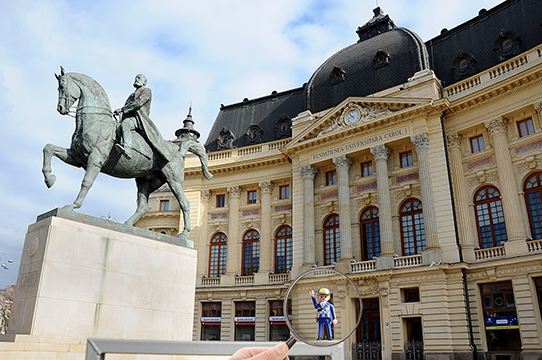 The final stop before the meetup was at the Revolution Square, admiring the National Museum of Art (The Royal Palace), the statue of King Carol I of Romania (1866–1914) and the Central University Library. Finally he arrived at Gara de Nord (train station). 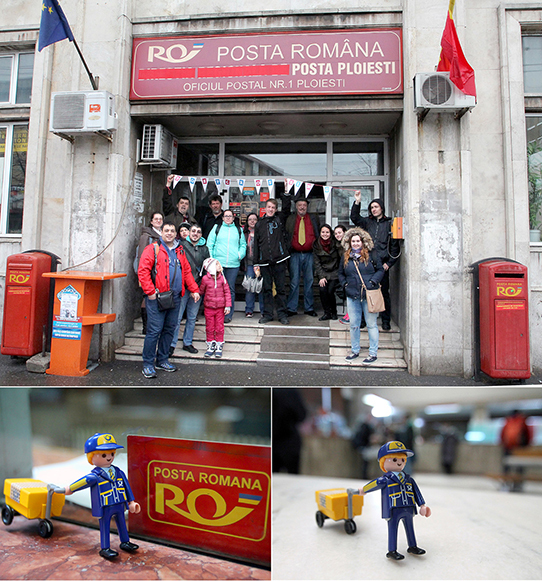 The little couriers’ cousin met with members of the Romanian Postcrossing Community and quickly jumped on the train to grab some seats. 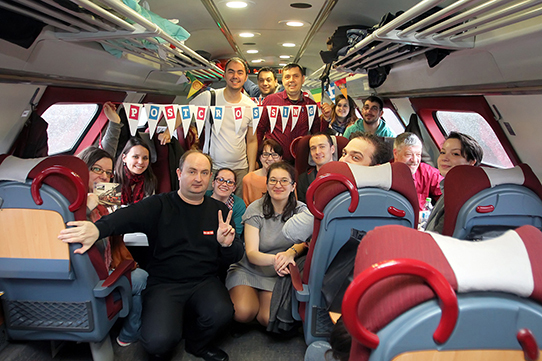 We had lots of fun activities during our trip from Bucharest to Ploiești (60 km), such as: signing postcards, organizing lotteries, tasting cupcakes and of course taking photos with our small guest, who even received a nickname for the day: Max! 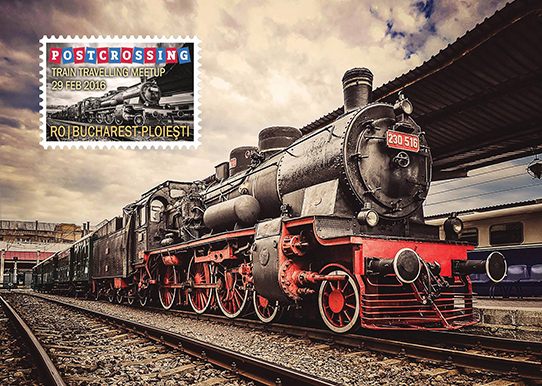 With this special occasion, we printed a limited edition meetup postcard, showing the Royal train of Romania (Photo by Mihai Raitaru). Everybody signed it — even the train inspectors, who were quite impressed by it! Once arrived in Ploiești, we gathered for a nice group photo and went on sightseeing, having a few hours available before the train back to Bucharest. 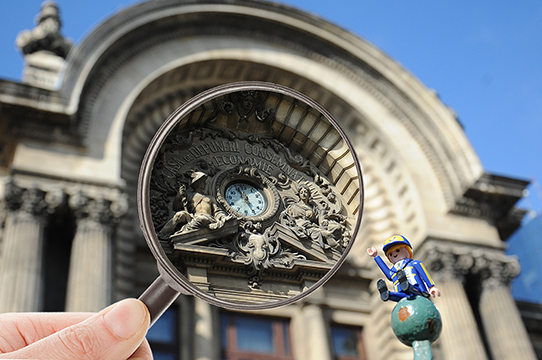 We first visited the Clocks Museum – the biggest clocks collection in South-Eastern Europe. The Art Museum was next on our list, where we took more photos and signed some more postcards in the lobby. Max got a special surprise from one of our colleagues, who played the piano for him. Before heading back, one last stop was made at the Postal Office to send our “train traveling meetup” postcards to fellow Postcrossers around the world and to say goodbye to little Max, who continued his journey back to Portugal. At the end of this full and fun day we all went back to our homes with many wonderful memories. We also found out that this was the first train traveling meetup in the world and all this was possible because Postcrossing exists! Thank you Postcrossing team for bringing us together, thank you for building bridges among people and nations! Happy Postcrossing, everyone! Anca, bardamu1964, cristinaS, corneljipa, dienuca, DrAmpie, eumihai2003, lamelemon, MaraMilu, MihneaR, modranhoria, mpalade, Nazareanu, NoarVladimir, Schumi99, spiderpc and susanica. — you can see lots more here! I got one of these wonderful Meeting-cards ♥ What a great idea for a Meeting-place. And "Postman Max" is a good idea for this little guy. What a great story! I like it very much! Wow, how incredible creative postcrossers are! Congrats guys, pretty sure you had unforgetable time. Max is a wonderful name for a mailmen representing a super-MAXimum project. And fair to him: his cousins have names, why not he? Such fun! Thanks very much! Great idea.... It looks like a lot of fun!!! Wow, how cool is that! A train meetup - this sounds really great. Wow! Great adventure. I enjoyed reading it all. Thank you. So fun!I want the special postcard!!! I am so happy seeing so many people happy.... I am wonder...little MAX arrived back in good condition? 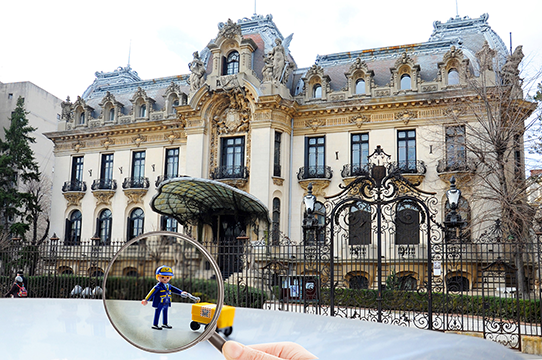 Using the magnifying glass to enlarge a special detail was brilliant idea. Well done, everyone. Max is a cool name for the little guy! Thank you so much for sharing - what a great day and neat way to do a meet up! It looks like everyone had a great day out. Wow! What a great idea, this train meet-up! 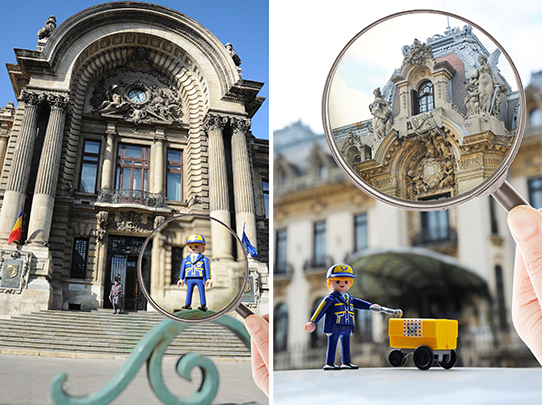 Thank you very much for sharing your day with us and for showing us the attractions of Bucharest and Ploiesti! Ati aratat din nou ca sunteti buni ! I´m agree with the Name. Thanks for sharing the happy moments and informations ! I received a card with lots of signatures from the postcrossing train too! Happy to see the images and know the background story on this. Thank you so much for sharing this story and photos. So nice idea! I was lucky to receive also this great train meeting postcard!!! A lovely romanian postcrossing story, also a wonderful name given for the little carier - Max !! Not the Mad Max but the Happy Max !! I wish I could join! It seems like a really nice meeting! Wonderful idea for a great meetup. I was lucky enough to receive one of your cards. I wish I was there as I love trains. Hopefully I will be able to join your next meeting! I should be moving to Romania in november this year and I'm really looking forward to it! Have a wonderful day! Oh, what a fabulous idea! I would have loved to be there. Love the little mail carrier too! Glad your journey was a big success! What a marvellous idea! Especially the train is a very nice idea. And what a beautiful card you made of it! What a great meet-up! Thanks for sharing photos of Romania..beautiful! What a wonderful experience, I would certainly enjoy a trip like that, nice way to meet fellow Postcrossers. Beautiful pictures, thanks for sharing the story! Postman Max sounds great to me. The fresco got me puzzled, though, because I thought frescos were murals and not on canvas. Also I don't think it's the biggest circular painting in the world - Panorama Mesdag (in The Hague, Netherlands) is also circular and has a length of 120 meters.